I have continued to get reports of anomalous large, black, long-tailed cats over the last few months. 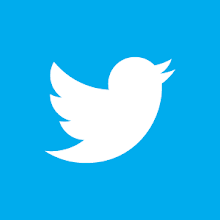 I have compiled some of the more interesting and, in my opinion, credible accounts here. To repeat something I have mentioned many times previously, I know that - according to science - there is no such animal as a black panther. Black panthers seen on television and the movies are either melanistic jaguars or leopards. Despite this fact, people continue to report sightings of these enigmatic cats. 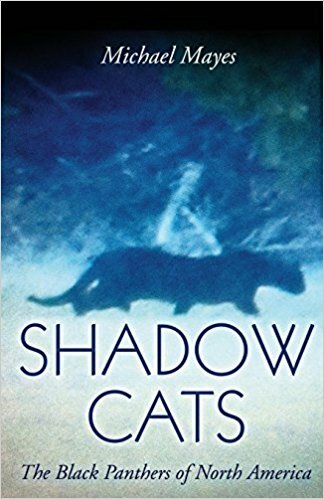 TCH Comment: Lori provides a pretty much textbook description of the cat people in Texas and the American South have labeled a black panther. The sighting area – Burnet County – has been the source of sightings in the past. 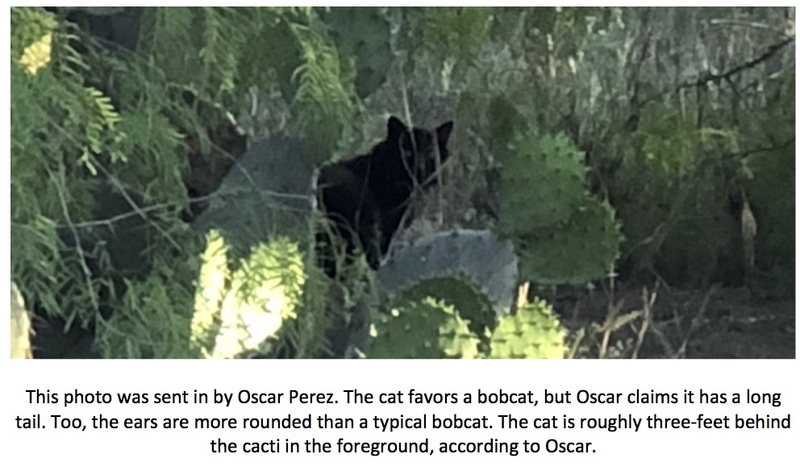 “These cats come around 1-2x/year... I’ve shot at them but have failed to bring one down to date. Most encounters are night time, usually unprepared shots with a handgun... some are Great Dane-sized with short fur... others are more squat, with longer fur. not sure what to make of the species... hybrid vs other. One cat had a checkered type pattern noted at night, approximately 30 yards, noted under red-light... I fired with a .22 revolver and I upset it. the animal in this picture is walking from your left to right... not sitting. It is approximately 3 yards behind the cacti not right up on them. See the how the facial fur flares out like a bobcat, but they do have long tails. It doubled back so we couldn’t get another shot. Any input would be appreciated. TCH Comment: Very interesting photo and description. Oscar seems to have a wide variety of animals visiting his property. It is possible there is some hybridization going on, but that is strictly speculative. The photo is intriguing as it does resemble a bobcat in the face. Bobcats can exhibit melanism, though it is rare. The ears appear a bit more rounded than I would expect to see in a bobcat. If this cat has a long tail then it is certainly not a full-blood bob. The whole thing is perplexing. 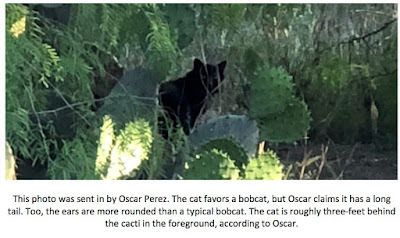 The cat Oscar saw with the “checkered coat” could be a jaguar, leopard, or, if it is a smaller cat, ocelot. It is hard to say as Oscar did not specify his location. The best advice I could offer Oscar would be to put up a few trail cameras and be ready, either with a camera or long gun - each time he goes out on the property. Oscar, if you see this, please email me back with your location. Thanks. “It was about 8:50ish-9 pm in Gonzales county. South east to be precise, around mid-November, 2017. We were going for a cruise down back roads like we usually do, having seen bobcats, coyotes and foxes out here, we were sure we’d see something. Little did I know. While on the road, I pulled out my flashlight and looked to my right side and bam, big yellow/greenish eyes caught my attention. They were a different color, the positioning on its head too was so unfamiliar. Un-like anything I’ve ever seen. It was crouched down, it did not want to be seen. Maybe it thought we didn’t see it but I did, I tried to get my uncle to stop the truck but by the time he did we had passed him. My light was still focused on him, as were his eyes fixed on us. As we started to reverse he kept watching. Before I got closer to get a good look at him, he got up and turned to his right, then made another right running behind the brush. All I saw was his hind leg and a large black tail that curled up a bit before it hit the ground. It was fat and round, He was about 15-20 yards from the fence line. I’m 23, 5’6 with normal size arms, I’d say his tail was easily as wide as my wrist-lower arm. I had goosebumps and immediately started looking up sightings. TCH Comment: Dro, thank you for submitting your sighting. The yellow-green eye coloration is something that I have heard from many witnesses in the past, especially those who had a nighttime sighting. A quick internet search for melanistic jaguars or leopards will show that a yellowish color to the eyes of these cats is not unusual. The effect could be exacerbated by the "eye shine" produced when light strikes a structure in the back of the eye called the tapetum lucidem. This structure improves night vision in animals of many species. The eye shine color often varies depending upon the angle at which light is striking the eye of the animal. Yellow, orange, and red are the most common eye shine colors seen in animals. Green would be something different. The description of the color, leg, and tail sure point to a cat being what you saw; however, since you didn't really get a good look at the entire animal, we can't be absolutely sure. I will have to leave the sighting off my distribution map. Keep those eyes open and a camera handy. Good luck. “I have a small farm just outside Canton, TX and have heard stories for years about a black panther that has been seen by many of my neighbors. I have been skeptical of these stories. Last week, one of my neighbors got these pictures of the “black panther”. Can you help identify this cat? TCH Comment: Thanks for taking the time to email the photos. Those are some very interesting pictures. It is hard to make a determination, however, due to the fact I have nothing by which to judge scale (the size of the cat). The good news is that this could be done pretty easily. Someone could stand in the spot where the cat is in the photo and a second person could snap a photo from the location where the photographer was standing for the originals. 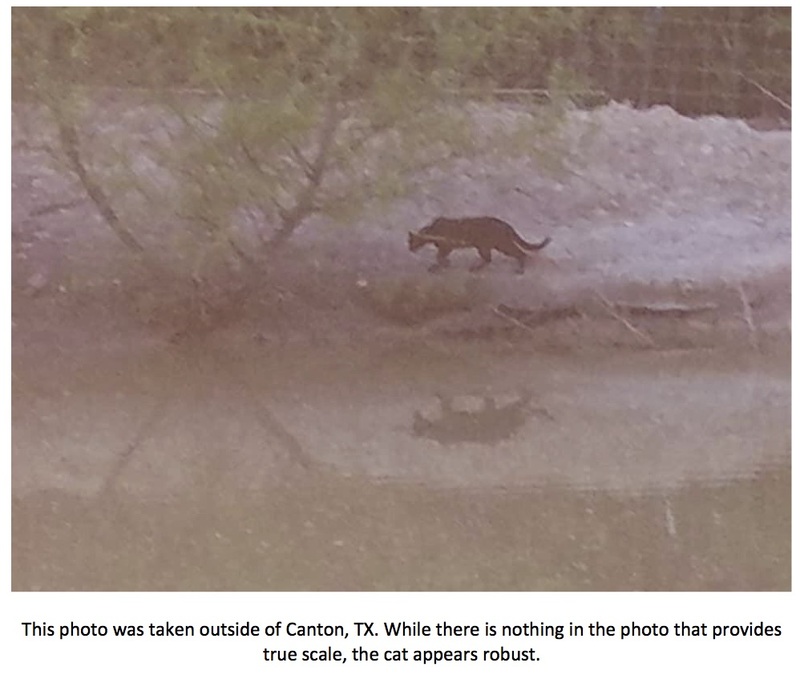 If only one person is available, that person could take an object that has a height or length that is known and place it where the cat was in the original photo was at the time. That person could then take a picture of the object from the same spot the original photos were snapped. By comparing the cat's size to the size of known objects we should be able to get at least a rough estimate on how big this animal is. 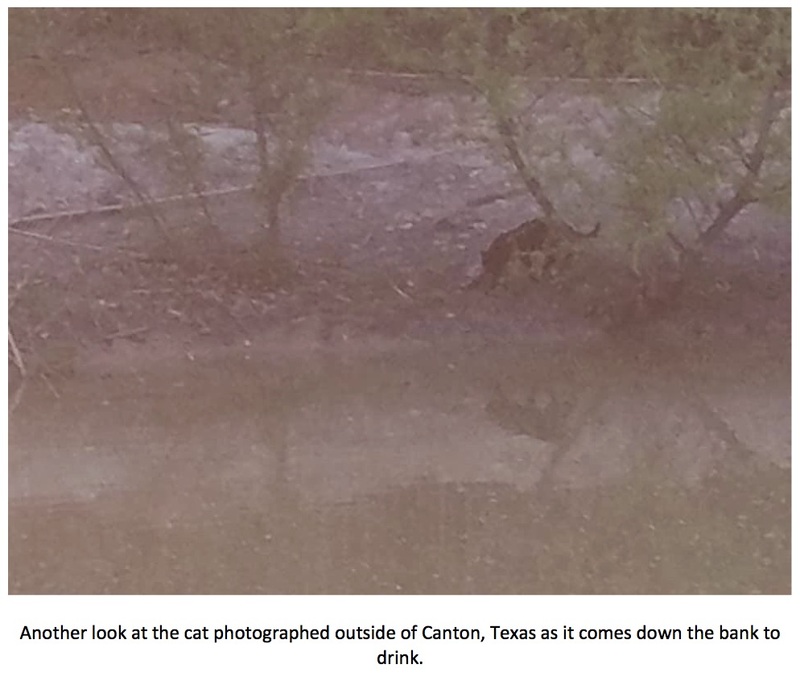 The photos remind me quite a bit of the cat videoed in Iberia Parish, Louisiana several years ago. I used a still from that video as the cover for my book. If any tracks have been found advise your neighbor to lay a ruler down next to them before snapping photos. Plaster casts could also be made. As to what kind of cat it might be...clearly, it is no bobcat. The tail alone eliminates a bob as a suspect. The head looks too small in comparison to the body to be a jaguar. The body is thicker than I would expect to see in a jaguarundi and the head doesn't look right for that species. That leaves a feral cat or mountain lion as suspects. As I'm sure you know, there are not supposed to be any black mountain lions. If we can get a reliable size estimate - using the methods mentioned above - we will have a much better idea of what we are dealing with. If you - or your neighbor - would like me to come out and place a camera or two in this spot let me know. I'm in Temple and the Canton drive isn't too bad for me. TCH Comment: Certainly, northeast Texas has been the origin for many black panther reports over the years. If Lanny is right, and this cat was around 100 lbs., our suspect list is very short. This is either a mountain lion or a jaguar. There is simply no other cat out there capable of reaching that size and weight. As long-time readers no doubt know, melanism has never been documented in mountain lions. My friend & I were driving down the county road late one night & we had just slowed down & turned a sharp curve by a pasture that keeps livestock. 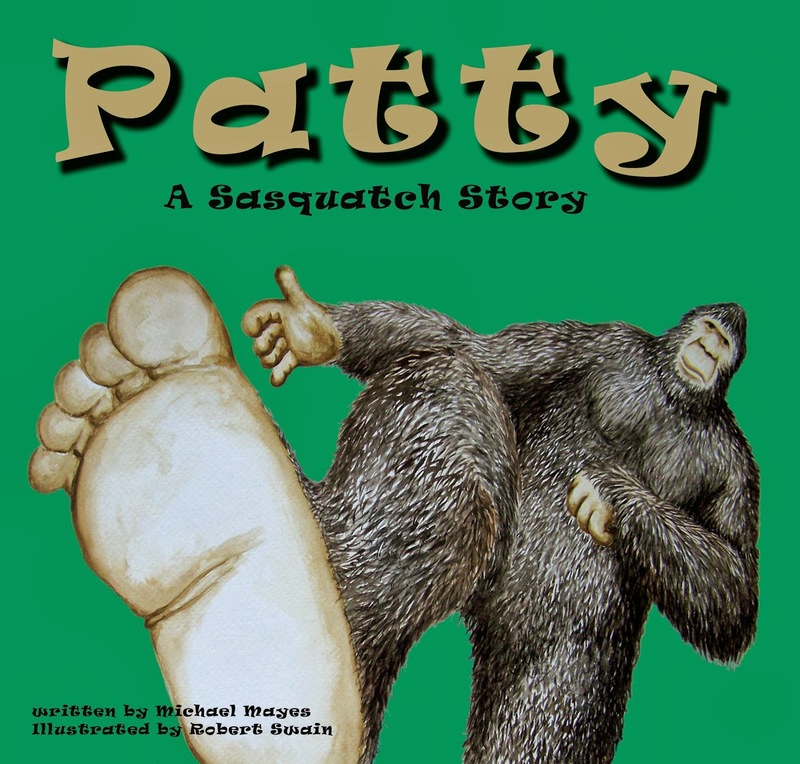 As I slowly drove around the left-hand curve, a very large cat with a big head, glowing eyes, shiny black coat (No details or markings stood out), and a very long, thick, wispy tail ran out in front of my car heading towards the pasture to my left & I had to slam on the brakes to avoid hitting it. The entire animal was so sleek & almost elegant in the way it sort of galloped across. My friend and I sat stopped in the road in silence for a few seconds before I asked if she had just seen what I did. We both agreed that it was definitely NOT a large dog and most certainly nothing we had ever seen before. It truly scared us because we spent many late nights with friends out in a neighboring pasture more times than I can count. We all stopped doing that. My grandma lived in Buffalo, TX & she would always talk of “panthers” coming into her yard & mating & eating the deer her & my grandpa fed. She said the sounds they made were terrifying. Like babies crying. Also, my boyfriend’s parents recently moved out to Neches, Texas. His step father claims that their new neighbor caught a bear on his game camera a little before Easter of this year. If you would like me to find out more details on that, let me know. I’ll certainly do what I can. I love what you’re doing on the subject of spotting unlikely animals. I’m so glad to share my information that not too many people believe. I hope my submission is useful! TCH Comment: Katie’s encounter is fairly typical in that motorists are second only to hunters in sightings of these black cats. Katie mentions that the cat was "big," but doesn’t give an actual size estimate. Katie, if you see this, could you please estimate/compare the size of the cat you saw to some other animal with which you are familiar? A Labrador Retriever, Great Dane, etc.? This would give me a better idea of how big an animal we are talking about. Also, Katie, yes, I would very much like to get the photo of the bear and hear the details on that as well. TCH Comment: Tricia’s account is very interesting for multiple reasons. She was with a long-time rancher who is very familiar with the wildlife in the area. This makes misidentification of something more mundane much less likely. Also, she gave a spot-on description of what a jaguarundi looks like. If Tricia was right about the size and weight – compared to her own 18-lb. cat – this was a jaguarundi on the large side. Breckenridge is west of Fort Worth in Stephens County. The county is sparsely populated and rural. There is plenty of room for a large cat to make a living there. Black panther reports have come from this general vicinity in the past. I am greatly encouraged that not only are reports continuing to roll in on a weekly basis, but more and more often these accounts are accompanied by photographs. People seem to be a bit more prepared to document what they are seeing than they were in the past. This is excellent news. I can be reached at Texascryptidhunter@yahoo.com should anyone want to report a sighting or share a photograph. 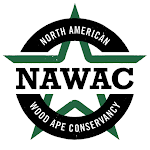 If there is anyone interested in having game cameras placed on their property, that is the correct email address for that as well.